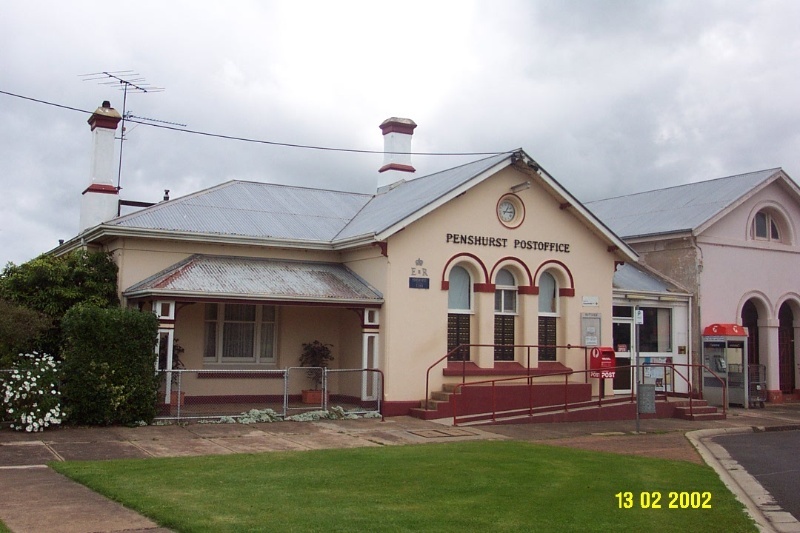 The Penshurst Post Office, Post Master's Residence and Court House complex is located at the north-west corner of Bell and Martin Streets in the centre of Penshurst. The site has a particular significance for its earlier use as the centre of the Mount Rouse Aboriginal Protectorate. It may be that those structures continued to be used for public purposes when the town was first surveyed and developed. In any case, the land became the Police Reserve and its present functions continue its role as the focus for the community. A new telegraph office was built at Penshurst in 1863 but this may have been subsumed into the later building. The complex is an asymmetrical, single storey, rendered brick building. The two main functions are expressed by different masses and roof forms. The Post Office is on the south side and the Court House is on the north side of the complex. It was built in 1877 to a standard design prepared by the Public Works Department. As well as the postal service, the building included a telegraph office and a residence for the postmaster. Along with all post and telecommunications services, the building passed to the Commonwealth after Federation in 1901. The Post Office facade, on Martin Street, is little altered unlike the matching Coleraine Post Office which was altered to a standard design during the Interwar period except for the entrance. The Court House has not been altered. Consequently the complex remains relatively intact externally to its original design. The Post Office, with its residence, is much altered internally and continues in its original functions. 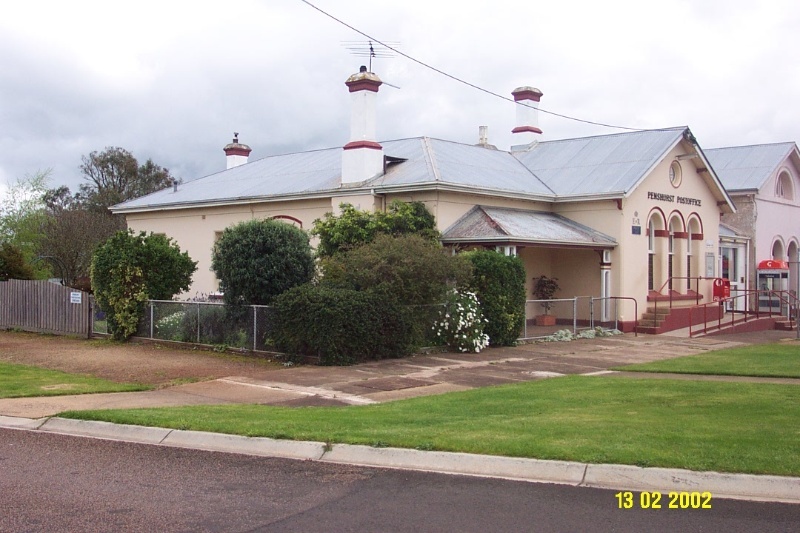 The Court House is little altered internally but is no longer functioning, the space now being occupied by the Penshurst Historical Society. The complex is in good condition. 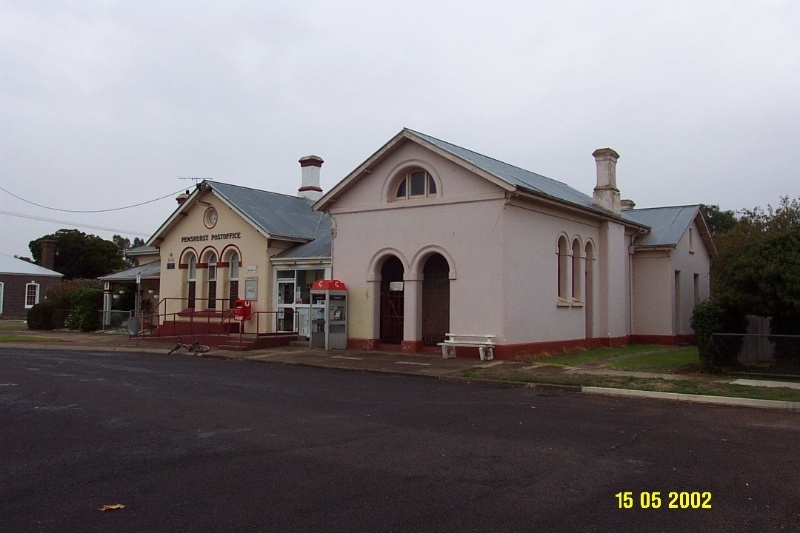 The Penshurst Post Office is of local historical and architectural significance to the Southern Grampians Shire and the community of Penshurst. , with the post offices in the other communities of the Shire, particularly that of Coleraine which is of the same standard design. The complex is in good condition. The Complex includes a post office, post master's residence and court house. The whole is a single storey, rendered brick building made asymmetrical by the juxtaposition of its two main functions. High degree of integrity externally throughout and internally in Court House. Low degree of integrity internally in Post Office and Post Master's Residence.